Dawn breaks over No.1 Court. In the corridors and walkways hidden in the bowels of the arena, Mrs Mouse is organising the mouselets. Her family has been a part of No.1 Court for generations, both the old court and the new. Tennis is in their blood and they love it. They could have stayed behind, back in 1996, and waited for the new Millennium building to open. They could have moved in there with the players and the media but they couldn’t give up the biff-bash-boff of the game itself. But today, they are on the move. “Hurry up everyone, we are going round to see Auntie Mavis on Court 9. No, Wayne, you can’t bring your Lego Roger Federer. And Brian – don’t do that to Wayne’s Lego Roger Federer. It’s not nice. You could see her point. As Milos Raonic and John Isner walked out for their quarter-final, they had thumped down 252 aces and 458 unreturned serves between them. Two heavyweights of the sport, Raonic stands 6ft 5in and weighs in at 216lbs while Isner is a towering 6ft 10in and 238lbs. In their previous four meetings, Isner had won three times and of the nine sets they had contested, seven had been decided by a tie-break. This, then, was not a match for the faint-hearted and breaks of serve were going to be a rare as hen’s teeth. And so they got to work. Ace, unreturned serve, service winner, game. Now and again, someone would have the temerity to get a ball back in play and maybe even win the point but after an hour’s play, there had not been a sniff of a break point. In the second set, they went through a 20-point run during which only two points went against the serve. There may have been more, but the man with the calculator stopped counting – there didn’t seem to be much point. By this time, the mouselets were getting restless. Over at Auntie Mavis’s, they had had their tea and were waiting anxiously for 7pm to roll around. Why, we cannot think. Out on No.1 Court, still no sign of a break point. And then, floating over the breeze there was the sound of rejoicing coming from the hostelries of Wimbledon Village. Apparently a chap called Kieran Trippier had done something rather important over in Russia. Still no break points on No.1 Court. “Mum! Mum! Trippier’s scored!” the mouselets cried. “That’s nice, dear,” Mrs Mouse replied, sounding distracted: an hour-and-a-half gone, two tie-break sets, one apiece. When would they ever get home? And then, just like London buses, two break points came along together in the third set: Isner converted his, Raonic didn’t. Third set to the tall American. On social media, reports of a hen with toothache started trending. By this stage, real rallies were beginning to break out. Some of them even went on a bit. By the start of the fourth set, the longest rally of the match was 10 shots. Even so, there was nothing by way of actual chances being created, nothing that could split open a set. The only significant action had been taken by the trainer who was called on towards the end of the first set to tape Raonic’s right thigh and then came back for a spot of massage at the start of the fourth set. But then, after two hours and 22 minutes, Isner manufactured two more break points by dint of working his way carefully to the net. Raonic snatched the first back and then pinged a forehand half-volley into the net – Isner was 3-2 up. Raonic’s injury woes got worse when, already a break down, he slipped slightly and appeared to tweak that sore leg. Gritting his teeth, he seemed in some considerable pain and within moments he was fending off another couple of break points. No matter, he clutched his serve close to his chest and kept Isner within sight. 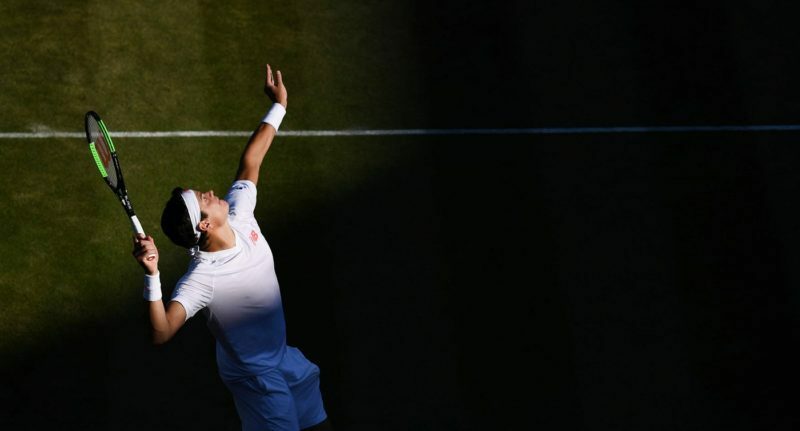 The problem was that the American’s serve was all but untouchable – and Raonic was running out of time and games to find a way to dent it, much less break it. That time ran out as a backhand volley into the net from the Canadian brought up Isner’s first match point which he converted with style, threading his own backhand down the line. He was through to his first semi-final in SW19.